BERLIN: Germany erupted in ecstasy Sunday, with fans dancing the night away, the World Cup final win against Argentina that handed the country its historic fourth title. 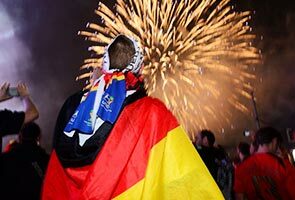 Fireworks exploded across Berlin as supporters cheering the 1-0 victory thronged the streets and honking cars snaked their way through crowds, with black, red and gold German flags flapping in the wind. More than 200,000 fans jumped for joy in the heart of the capital, singing "Oh, it's beautiful!" and chanting "Super Deutschland". The city closed the so-called Fan Mile to traffic behind the Brandenburg Gate, the symbol of national unity, to make way for revellers cheering on the German side in its showdown against Argentina. "This victory is hugely important -- it's my first!" said Carsten Glaser, 20. He said that while the Germans were a "team", "Argentina only had (Lionel) Messi." Many fans saw the victory as having a deeper historical resonance, coming a long 24 years after West Germany beat Argentina in 1990 just months before the country overcame its Cold War division. "This victory is important for reunified Germany," Thorsten Kinscher, a 34-year-old employee in the shipping industry, said. "It shows we are really in this together," behind a team of players from the former west and the ex-communist east. Crowds surpassed the 200,000 maximum capacity on the Fan Mile hours before the match, an event spokeswoman said. Braving intermittent showers, vendors did a booming trade in currywurst, a local speciality of sausage smothered in spicy ketchup, and plastic cups of beer. Millions more huddled in front of screens at beer gardens, bars, sports clubs and sitting rooms across the country to watch the match from Rio de Janeiro's legendary Maracana stadium. Normally a rare sight due to the country's dark history, German flags fluttered from street lamps and supporters' shoulders, worn like superhero capes. Revellers young and old, male and female donned mohawk wigs, bunny ears and cowboy hats in the national colours, as well as Hawaiian-style plastic flowers in black-red-gold. Anett Voelker, 42, said it had been a long 24-year wait for a fourth star for the German jerseys. "It's been a super championship for reunited Germany -- a feeling of even greater unity," she said. At half-time with the match tied at 0-0 after a nerve-jangling series of near-misses for each side, some fans started to lose their swagger. "The Germans aren't playing well -- Argentina is better," said 18-year-old Tom Ulmann, tiny German flags painted on his cheeks. "If it continues like this we're going to lose." Germany had led Brazil 5-0 at the same point in the semi-final match last Tuesday, which they went on to win by a jaw-dropping 7-1. But a desperately awaited goal in overtime by Mario Goetze revived spirits and the final whistle sealed the celebration. "I am so surprised and relieved," said Frank Wegner, a 45-year-old from Brandenburg state outside Berlin.